Today Nature has presented it’s new online digital edition. I recommend using full-screen mode, click on the icon to the lower left (shown to left). If you are using a laptop, as I currently am, you will probably still find it a challenge to read the text. If you click on the text, it will zoom in. While zoomed-in, moving the mouse will move the page. Clicking the mouse again will return you to viewing the two-page layout. 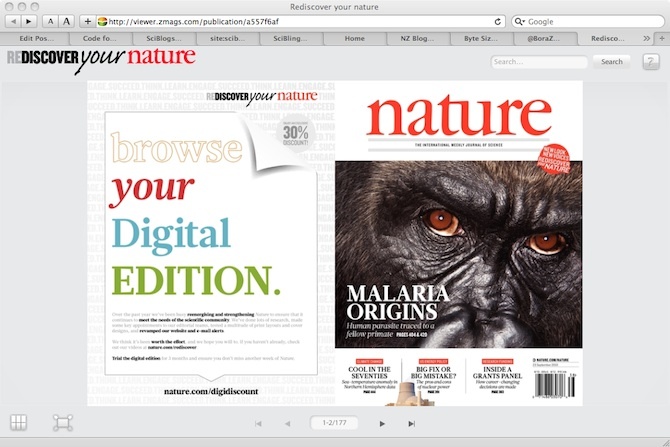 As you can see the concept, like other digital magazines, is to present the user with the magazine as they might read it physically (via a Flash application). The Editor-in-Chief’s introductory articles says it comes with a three-month free trial, if you register. While I am awaiting confirmation of my trial registration, let me review what I can in the meantime. Bear in mind I am using an Apple machine, viewing the magazine with the Safari web browser. The options to print and download articles, shown in the online help (click on the question mark to the top-right), don’t appear: I presume you need to register or subscribe for these to be available. I like the idea of being able to read the text before downloading a PDF copy: too often I find having to deciding if to download a paper from only the abstract or a leader of a few hundred words a bit hit-and-miss. Those with trackpads on Apple computers will find that they can zoom in and out seamlessly using a two-finger gesture, which I find very nice. An equivalent should be possible on the smart mouse, which has a trackpad surface. Because the Safari web browser gives the web page priority over the keyboard shortcuts (at least under Mac OS X), the magazine’s browser effectively ‘takes over’ some of the short-cuts. For example, usually shift-command+left-arrow will take you to the web browser tab to the left. 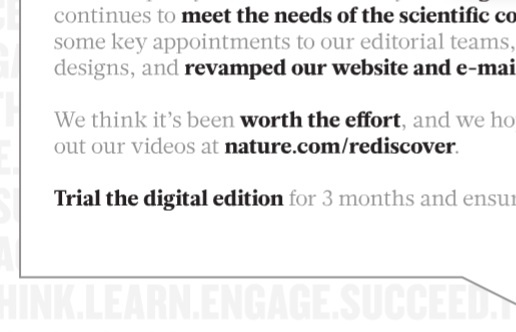 If you’re in the Nature online page, it’ll interpret that as ‘go to first page’. Likewise, right and left-arrow will turn pages in the expected direction. Have a browse and see what you think! Grant, thanks for your helpful feedback and for the helpful explanation of how to access the free trial link for the digital edition. You’re right, it is too hard to find and we’re working now to make that obvious on nature.com/rediscover. Our apologies. In the meantime, the direct link to register for the free trial of the digital edition is here: https://www.sunbeltfs.com/forms/na/digital.asp?eid=W00923 and there is no obligation to subscribe. P.S. Although is Nature is perceived as British, it is international, with staff in NY, D.C. and elsewhere around the world. Hopefully that international perspective comes across in the articles, as well as the video presenter’s accent! Good to see the prompt feedback! Itâ€™s fine, I only had trouble because of the small size of the screen I happened to be trialling it on. You are right that Nature is (now) international. My error. I suspect I tend to view it as a British publication that has expanded, rather than viewing it for what it is now, through being a little older and having first read Nature when it was much more a UK publication, and having studied in England. (What I get for being old enough to have pastâ€¦?!) Younger readers might see it more for what it is now – ?